Monday 21st March-Australian Market Wrap | Beeks Downunder-Because not all financial news is boring! 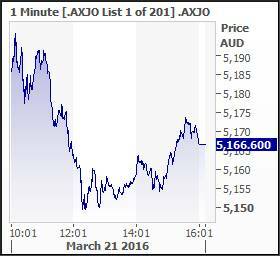 ASX 200 slips 16.5 to 5166.6 on political news after a mildly positive start. Banks suffer on uncertainties and bad press. Asian markets mixed with China positive up 2.2% and Japan on holiday today. 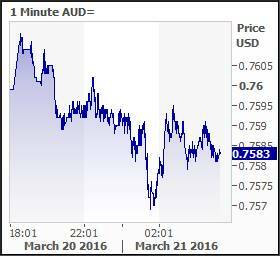 AUD backs off to 75.85c on profit taking with RBA chief to speak tomorrow. 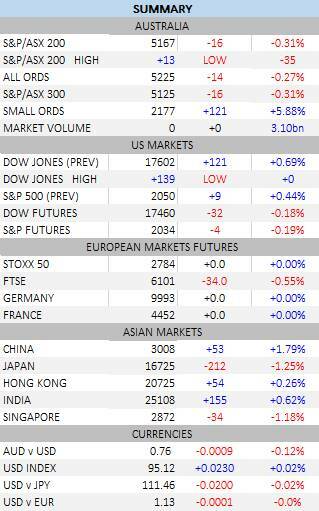 US futures down 35 points. A positive start to a quiet shortened week was hijacked by politics as Malcolm Turnbull moved towards an early budget, an early election and a possible double dissolution. The surprise move from the government will take the wind out of the markets sails and the thought of 15 weeks of potential campaigning leaves no one filled with glee. Banks again gave up early gains as resources faded despite higher Dalian Futures prices for iron ore. Energy stocks gave back after Crude futures extended their declines in Asian trading. WTI fell to $38.95. Not much of significance this week so we will be hostage to overseas and thoughts will turn to Easter pretty quickly. 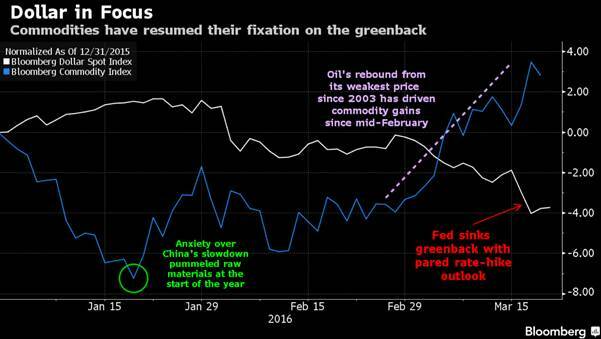 No surprise that as the US dollar has gone down, commodities have gone up. Resources were mixed with BHP +0.39%, RIO +0.11% and Fortescue Metals (FMG) -0.36% off slightly. Base metal stocks were easier South32 (S32) -1.27%, Lynas Group (LYC) -2.41% and Sandfire Resources (SFR) -2.13%. Energy stocks fell away as Crude prices slipped in Asian trading. Santos (STO) -2.96%, Origin Energy (ORG) -3.17% and coal stocks also lower Whitehaven Coal (WHC) -5.84%. Industrials mixed with healthcare stocks better. Primary Healthcare (PRY) +2.7% firmed on takeover potential. Monash IVF (MVF) +2.99%, ResMed (RMD) +1.1% and CSL +0.4%. Speculative Stock of the Day: Enterprise Metals (ENT) +47.06% following financial results last week. Virgin Australia (VAH) +8.57% after securing a $425 million loan facility from its four major shareholders: Air New Zealand, Etihad Airways, Singapore Airlines and Virgin Group, giving it breathing room to review its capital structure. It has 12 months to fix up its balance sheet and review its debt equity balance. Tox Solutions (TOX) is in a trading halt and looking at a fund raising to make an acquisition of the NSW waste group, Worth, for around $70m. Macquarie Group (MQG) -1.05% is on the nose following media reports on its exposure to the ‘junk ‘bond market. In the AFR today there were suggestions they its exposure was very risky with a growing exposure to BB and B rated bonds. MQG argues that its exposure is well-managed and that the lending to non-investment grade loans is misleading. The loss rates on Macquarie Group’s Corporate and Asset Finance business was only 0.2% annually. More news from Foxtel on its plans to put Netflix on its Apple TV equivalent ‘puck’. Telstra (TLS)0.57% already has its own ‘puck’ coming called Telstra TV and has Netflix and Stan on the platform. This is all against a backdrop where Telstra is considering floating its 50% of Foxtel off in an IPO. Of course the question would be what does it do with the $4.5bn. It is hardly short of cash or cash flow. Growth is the thing in short supply. Cimic (CIM) +1.52% following news of a possible contract win for the Gold Coast stage two light rail contract. The $420m funding has just been announced and Cimic is sitting in the box seat as preferred tenderer. Malcolm Turnbull has announced the Senate will be coming back on April 18 to debate and hopefully pass the ABCC bill. If not, then we will go to the polls on July 2nd. Whatever the result, the Budget has been brought forward a week giving Scott Morrison a few extra headaches to get things ready in time. Treasurer Scott Morrison says digital currencies such as Bitcoin will be exempt from GST and restrictions on crowdfunding eased, under a raft of changes to boost the fintech sector. The government will also reduce tax barriers for venture capital investing in fintech companies and is working with the corporate regulator on a “regulatory sandbox” for start-ups that will allow them to focus on developing new products first and regulatory requirements later. Australians’ mortgage debt has more than doubled in just over a decade to a record high. Housing debt per adult increased 136% from 2004 to 2015, according to analysis of numbers from APRA. The average national loan size is up from $189,300 in January 2004 to $372,400 in January 2016. Speaking tomorrow is Glenn Stevens as he attempts to jaw bone the AUD lower despite the wall of money coming from international investors seeking a positive yield. Margin lending is back it seems in China, with news that Citic Securities will resume offering loans for as long as 182 days, that brokerages can use to fund margin trading. PBoC Governor Zhou and Vice Premier Zhang indicated at the annual China Development Forum in Beijing that they think overall lending in Asia’s largest economy is too high. Vice Premier Zhang said the government would do what it must to avoid turmoil in stocks, the currency, bonds and property. “There will be no systemic risks – that’s our bottom line.” Whatever it takes. There are some seasonal new year factors at play but a worrying sign from China is the fall in car sales. One to keep an eye on given the level of scepticism on official GDP numbers. Dyson is looking to invest $1bn in developing new battery technology as it seeks to diversify away from vacuum cleaners. The company is just weeks away from a new product launch that will disrupt an established market. US hotel group Starwoods has become the first US firm to ink a deal with Cuba since 1959 as President Obama lands in Cuba. The first President to visit for 88 years. A UK exit from the EU would cause a “serious economic shock”, potentially costing the country £100bn and nearly one million jobs, according to a report commissioned by the CBI. The business lobby group said a study found that a vote to leave would have “negative echoes” lasting many years. It said the cost could be as much as 5% of GDP and 950,000 jobs by 2020. The bun fight continues.